The stories in this collection are unified by a sense of dislocation. In each of the pieces, there is an underlying element of disturbance and disharmony. Resolution threads its way through the narratives while the characters struggle to navigate conscious choices and come to terms with new realities. A perspective that views the complexity of life journeys as a manifestation of intentional decisions, circumstances beyond one’s control, and the need to reflect upon the combination of both in order to become fully realized, drives the narrative voices. 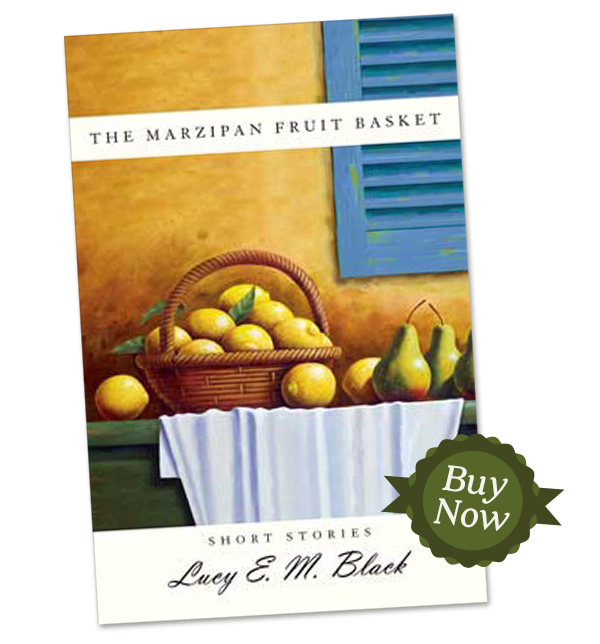 Want to find out where you can buy The Marzipan Fruit Basket? Available now in stores and online. Click here to learn more. Is The Marzipan Fruit Basket your Book Club’s next read? Download a list of great discussion questions for your group. I had been promised an adventure: a nice train ride, a visit with Tante Edda, and a trip to the sea. This wasn’t a nice train ride. My mother was acting strange. I didn’t like it. “When can we go home?” I asked her. “I miss everyone.” I didn’t want to go home particularly but I had discovered that this question was a way to get attention. Usually it made her circle me with her arms and smooth my hair, and tell me what a good kind I was. This was not the expected response and I began to cry. Little tears. “What’s wrong now?” she asked me. Clearly impatient. And my mother began the story of Tante Edda and Ome Hendrik, and Maartje and the terrible time near the end of the war when there was nothing to eat but herring and shrimp and no eggs and no vegetables because the soldiers had taken everything, and how Maartje became weaker and weaker and her little legs became so thin that she couldn’t stand on them and had to lie down on the bed all day long, and how she just faded away and died and there was nothing to be done. And I fell asleep while she was talking and when I woke up she was shaking me and the train was stopping.